UPDATE: GenevaSound targets the traveller with Model XS Bluetooth speaker | What Hi-Fi? 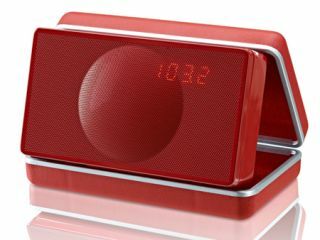 We've just had confirmation this morning that the GenevaSound Model XS Bluetooth speaker – which we first saw at CES 2012 last week – will officially go on sale in the UK this month for £179. Its waterproof clamshell case is available in red, white or black faux leather, which flips open to reveal a slender piano lacquered cabinet inset with a distinctive domed grille. Full details are in our original story below. Now this just caught our eye: the Geneva Model XS Bluetooth travel speaker, currently being shown off at CES 2012. Based on the design of classic travel clocks, it packs two 1in tweeters and a 2 1/4in woofer into a waterproof case. You also get a digital alarm clock with touch-sensitive controls, FM tuner and a rechargeable battery that's good for up to five hours of charge. The compact clamshell can stream music over Bluetooth or connect using an aux in port, and packs a digital amp into its pint-sized frame – it measures just 15.7×10.2×11.5 cm.